I took an unexpected short break this week, and it was nice:) Now I’m back to the grind. I just want to let you know that I will be co-hosting an event at the Goody’s store in Danville, Kentucky TONIGHT from 7-9 p.m. There will be lots of giveaways (including a $250 one! ), makeup demos by yours truly and What Nicole Wore, fall fashion styling, and hors d’oeuvres. The best part is 10% of tonight’s proceeds go to Dress for Success Lexington!!! If you live in the area, be sure to come out. I’d love to meet you! Fall has arrived, and I can now wear plaid to my heart’s content. This plaid shirt dress from Old Navy is so cute! It’s non-maternity, and I just went up a size to accommodate the bump. It’s lightweight enough for those in the south to not be miserable while wearing it. I also like that this shirt dress is a longer length. It will pair great with tall boots when the weather gets colder. And it comes in 4 different plaids! I’ve been wearing these olive slip-on sneakers as much as the weather will allow. They’re just $25 and so comfortable! Slip-on sneakers are one of the hottest trends for fall. This pair also comes in black and blush. To be honest, I kinda want both other colors! Have you started working plaid into your wardrobe yet? Thanks to Lee’s Lookbook for snapping these photos! Such a cute, casual look. It’s great with the slip on sneakers! Thanks, Kellyann! I really want the blush pair of these sneakers too! That’s for sure! Now I have to find some maternity tights. The dress looks really cute with the slip ons. It’s a fun casual look! Love the slip ons for a sporty, casual vibe! Really cute dress. Perfect to dress up or down. Thanks, Kay! It really is. Old Navy has really been upping their game in the dress department. This one is adorable! Girl this is just such a cute outfit. 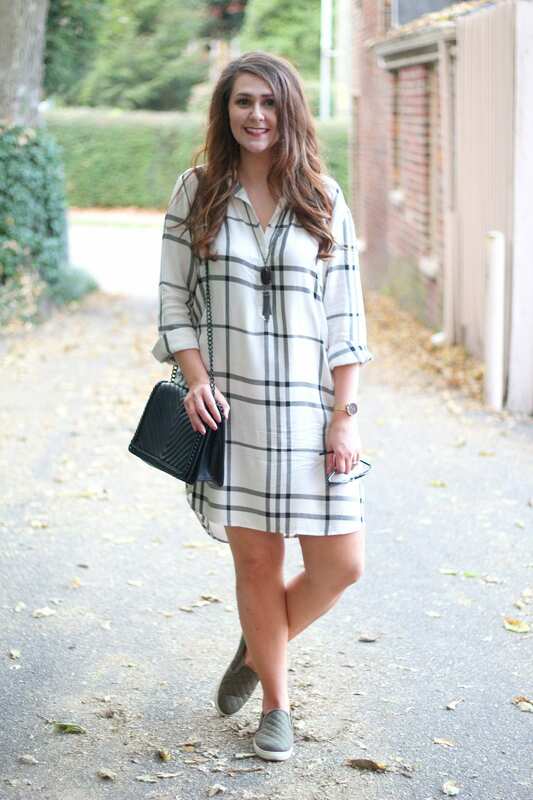 I love a good shirt dress and this one is such a great neutral! THanks, friend! When I saw it, I had to have it! Such a pretty casual look! Love the dress with the sneakers. Thanks, Amy! It’s such an easy look! I think the sneakers make this dress so fun and modern!!! Perfection! Thanks so much for linkup up with the Ageless Style Party! Thanks, Jodie! I’m really liking the pairing! Love those sneakers with your plaid dress! I’m seriously wearing them with everything! This is the second time I’ve seen that plaid shirt dress pop up this week, and I’m thinking now I may need to go try one on. Great look!